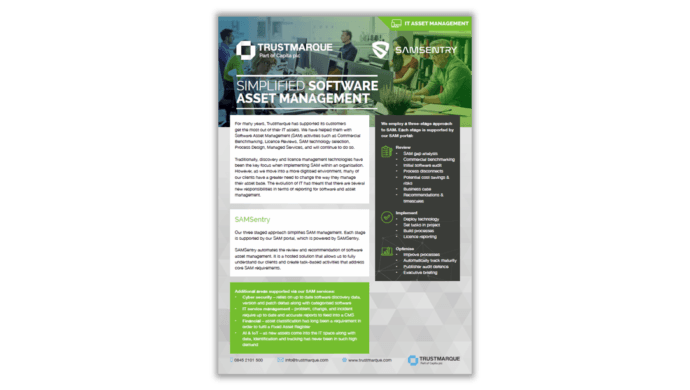 Trustmarque’s IT Asset Management enables you to take control of your IT assets to drive cost savings and ROI, create process efficiencies and limit vendor compliance risk. Why choose Trustmarque IT Asset Management services? We work closely with organisations to review their existing IT estate and develop best practice policies and processes when procuring or managing new and existing IT assets. Our specialist asset management consultants provide support at all stages of the procurement lifecycle to help achieve cost savings by ensuring you only buy what you need, when you need it. Our consultancies are designed to help organisations to become more efficient, remain compliant and optimise spend and usage when managing and procuring their IT assets. We have helped hundreds of customers in both the pubic and private sectors deliver operational efficiencies, improve software asset control and achieve significant savings through effective IT asset management – most make an average of 38% of savings on their procurement spend. Our Software Asset Management (SAM) tools and services help organisations intelligently manage IT costs and take control of their IT assets. This can include implementing policies and procedures to support new and existing software assets and extensive licence management control to optimise spend and usage, mitigate software risks, as well as remaining compliant across the business. We employ a three-stage approach to SAM. Each stage is supported by our SAM portal, which is powered by SAMSentry, an innovative hosted solution that automates the review and recommendation of software asset management. Compliance overspend is an issue for many organisations. Some are committing vast resources to adhere to regulations set by third parties, whilst others are overspending on compliance for software that they simply do not use. 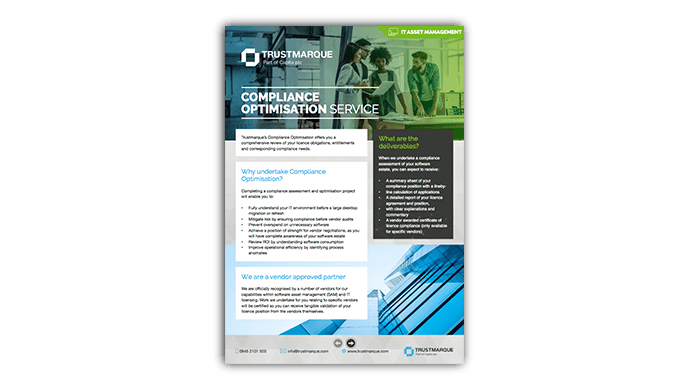 Our Compliance Assessment uses industry-leading tools to analyse and optimise your current software licensing agreements. This comprehensive review of your licence obligations, entitlements and corresponding compliance needs evaluates your software estate quickly and with minimal cost. Why undertake a Compliance Assessment? Organisations are under constant pressure to reduce budgets by doing more with less. But with the complexity of software licences impacting a significant portion of your IT budget, reducing costs can prove challenging. 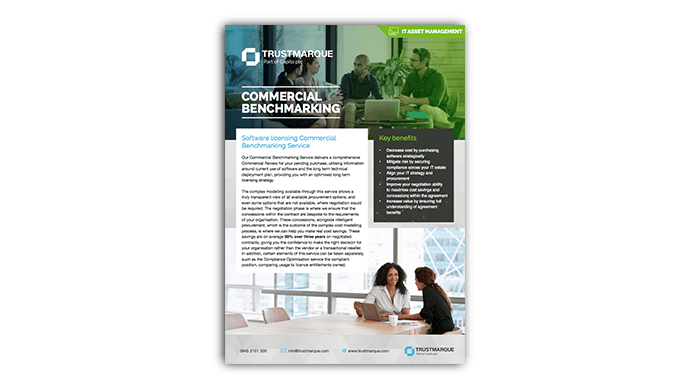 The Commercial Benchmarking Service delivers a comprehensive Commercial Review for your pending purchase, utilising information around current use of software and the long-term technical deployment plan, providing you with an optimised long term licensing strategy. Discovery and licence management technologies have been the key focus when implementing Software Asset Management (SAM) within an organisation. However, as IT evolves, software and asset management takes on a number of new responsibilities in terms of reporting. SAMSentry is a hosted solution that allows us to automate the review and recommendation of software asset management​ to create task based activities that address core SAM requirements​. Software asset management is a crucial part of an organisation’s IT budget and often represents a significant investment. With business and technology needs subject to change over time, you need to ensure your IT strategy adopts a long-term approach. 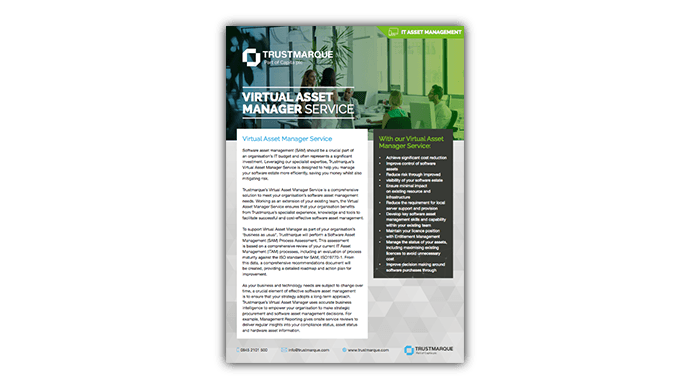 Our Virtual Asset Manager Service is designed to improve efficiencies and increase long-term intelligence around your organisation’s existing software asset management processes. It will help you manage your software estate more efficiently, saving you money whilst also mitigating risk. Our Software Procurement services provide professional IT advice and recommendations to ensure organisations get the most out of their software investments to effectively manage your software estate. By procuring software cost-effectively and then continually managing it you will maximise your investment.